This is me last April. Wasn’t I adorable? I started out with two floppy ears, as you can see in my picture from the day I first came home in March. 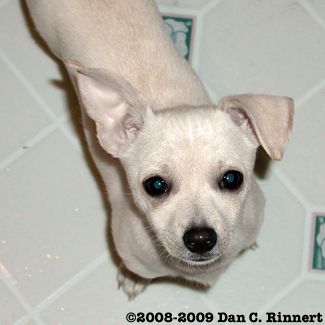 The month after I came home, my right ear straightened out, but my left ear stayed floppy. It was floppy for several weeks. I was so cute. I am still cute, though, even with both ears being straight. Sometimes, though, when I’m really tired and wake up in the morning, one or two of my ears might be floppy. But not for long! Why are chihuahua puppy ears floppy? It’s actually natural. It’s because when we’re young, our ears are still soft and not hardened. It’s the cartilage that’s still soft, I’m told. For most chihuahuas, the ears will gradually straighten. The time may vary by chihuahua, but most of us have our ears straightened out by the time we’re half a year old or so. But some chihuahuas might have floppy ears all their lives if it’s in their genes. I guess it’s perfectly fine that my ears straightened at different rates. I’d rather go through a half-floppy ear stage than pimples and stuff like people do. This entry was posted on Saturday, February 28th, 2009 at 3:34 pm	and is filed under Little Too. You can follow any responses to this entry through the RSS 2.0 feed. Review of "The Ultimate Chihuahua Care Handbook"
LocoChihuahua.com and Canville Virtual Village are a service marks and/or trademarks of Canville Communications. "Chihuahua" illustration by Matthew Laznicka of Basement-Productions. Except as noted, page design, logo, graphics, images and other artwork by Canville Communications. Any use of our articles, stories, graphics, images or other artwork or content without our express written permission is strictly prohibited. Copyright 1996-2009. All rights reserved.